Pushing for more fiscal transparency + public participation + accountability through GIFT? The main objectives of the meeting were to (i) create a shared view of the key strategic issues for the next phase of GIFT in the next 3 years; and (ii) to gain broad agreement on how to address the identified main issues in the development of the next phase and agree a way forward for any outstanding issues. • The key challenge is the slow and uneven progress in improvements in fiscal transparency, public participation and accountability by governments around the world. Crucial to understanding the challenge is placing the interests of the citizen and the people at the center. • GIFT’s unique comparative advantages, as a multi-stakeholder action network, is its convening power enabling all the major institutions to sit around one table, enabling GIFT to bring key actors together, to challenge them, to encourage them to work in a coordinated way. GIFT’s role as an amplifier of the voice of the citizen is key. • GIFT is successful in its work on harmonization of norms and in its powerful relationship with the Open Government Partnership (OGP). Stewards agreed this work should continue. Two new areas of work in particular were agreed: linking the fiscal transparency agenda to reducing corruption; and expanding transparency of revenues. Better communication and 'bringing fiscal transparency alive as a human issue’ could be a way to building stronger connection to the corruption and anti-corruption agendas. • Participants indicated that the network’s membership should expand to achieve a more global coverage. Also, the meeting agreed that there needs to be better communication and coordination between Partners/Stewards/Lead Stewards and the GIFT Coordination Team in terms of country-level linkages and participation in appropriate fora. The lead IMF representative, Manal Fouad, acknowledged the very encouraging and positive achievements of the Network and restated that GIFT was a valuable forum for the IMF. Going forward, the lean, flexible structure of the Network is an appropriate model for the future work. Fayezul Choudhury (IFAC) reiterated the usefulness of the day’s discussions and was optimistic about the Network’s future. The lead World Bank representative, Jim Brumby, emphasized that GIFT was created to be a game-changer and we must continue to push for significant changes in the fiscal transparency environment. There are important linkages with the anti-corruption agenda and work on expanding transparency of revenues. The World Bank will continue to embrace GIFT’s work in its country-level operations. He concluded that the event had been a good opportunity to stand back and exchange with colleagues and friends. Warren Krafchik (International Budget Partnership) publicly thanked the Director for his energy and passion and the GIFT team and the resulting impact on work and quality of the Network. IBP recognizes the value of GIFT and will continue to work towards the strategic objectives. He highlighted the greater effort needed in making sure we harness a more diversified set of civil society actors to help with country level work and to ask the uncomfortable questions. The workplan for GIFT’s next phase will be available in early 2017 for consultation with Stewards. On September 2016, the Swedish Development Advisers finalized their independent evaluation of GIFT's work from 2013 to 2016. The preliminary findings were reviewed during GIFT's Strategic Planning Meeting. The overall findings of the evaluation concluded that GIFT is a successful network, uniquely placed as a learning forum to offer support to reform for greater fiscal transparency, public participation and accountability. Evidence gathered by the evaluation team has shown that GIFT is highly relevant and, crucially, that convergence and increased coherence around the norms and standards on fiscal transparency would not have happened without GIFT. The evaluation is available here. What's in the evaluation report? - Provide input to the future design and strategies for the initiative. 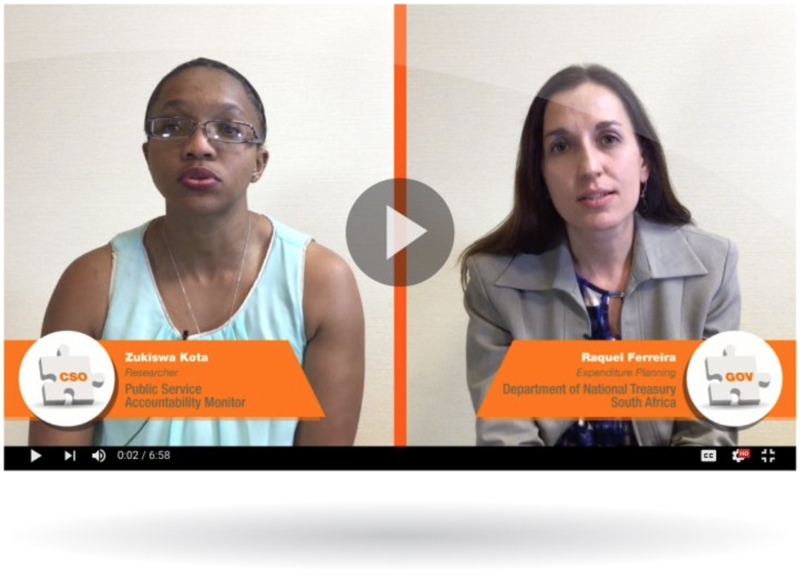 3 fast Q&A about #PublicParticipation! 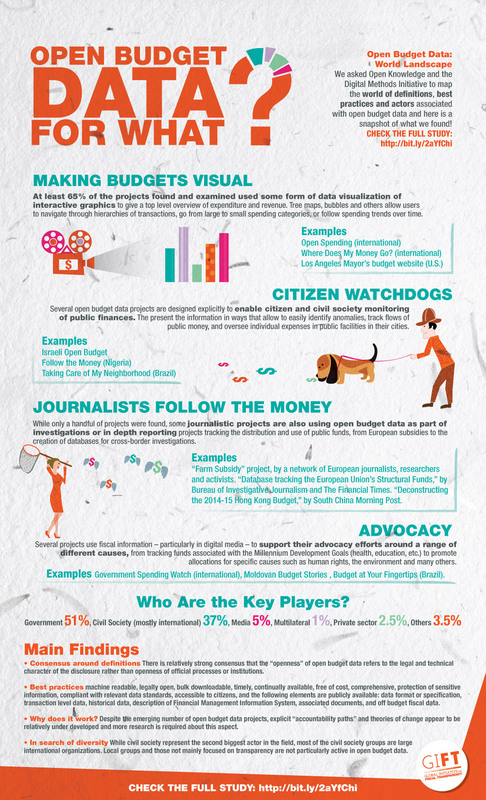 2 new GIFT’s #infographics on #OpenData! 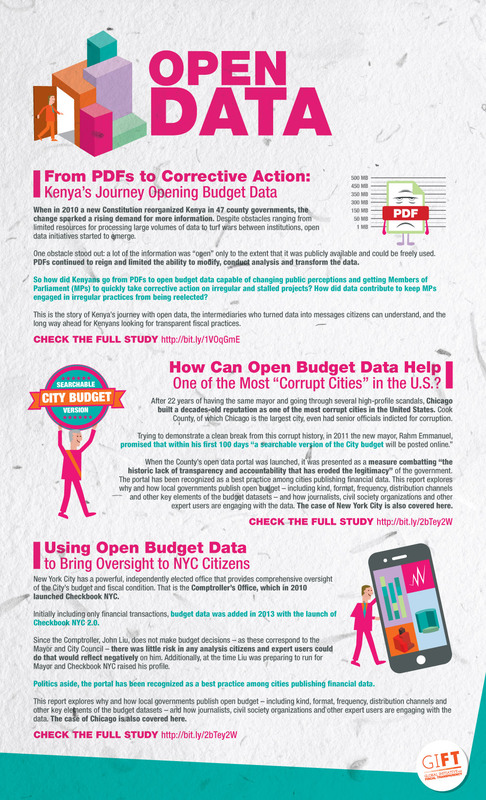 Open Budget Data for What? 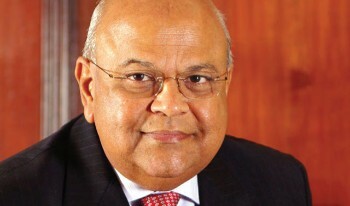 Finance minister Pravin Gordhan has announced an open data portal for local government budget information, providing citizens with access to comparable, verified information on the financial performance of each municipality in South Africa. Added by Staff Reporter on 26 October 2016. Developed in partnership with Code for South Africa (also known as Code4SA), a nongovernmental organisation that promotes informed public decision making using technology, the Municipal Money website “aims to promote transparency and citizen engagement through the visualisation and ‘demystification’ of information about municipal spending”, national treasury said in a statement. The hope is that it will stimulate citizen involvement in local governance. It is in line with international best practice, in terms of which governments are increasingly opening up their data to the public, specifically budget data, to promote oversight, transparency and accountability, it said. “South Africa has demonstrated its commitment to open government by co-founding and participating in the Open Government Partnership, a partnership of more than 69 countries committed to working together to develop and implement ambitious open government reforms,” national treasury said. 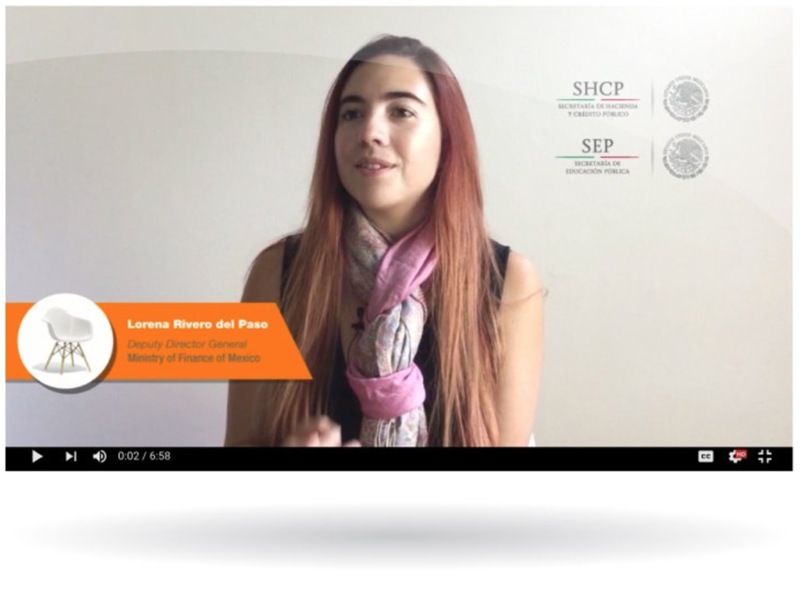 Municipal Money utilises a variety of media and tools to present key municipal financial information, and also to explain the related financial concepts and their relevance to citizens. “The website is designed for an audience who may or may not have any financial knowledge or background, but also caters for the more data-savvy user who may want to trace and grapple with the actual datasets,” treasury said. The raw data can be used by analysts or app developers in conjunction with other data sources to create new applications for municipal financial data. New International Budget Partnership' paper! Over the last decade, successive rounds of the Open Budget Survey (OBS) have shown that the average level of budget transparency around the world is modestly increasing. This progress has mainly been driven by countries that started from a very low base, as reflected by their low scores on the Open Budget Index (OBI). 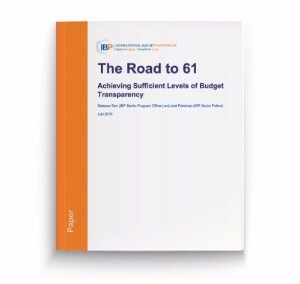 However, a significant number of countries persist in providing only limited amounts of budget information to the public (scoring between 41 and 60 on the OBI).